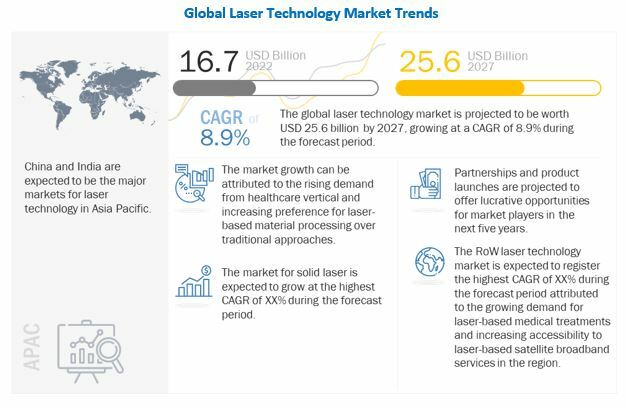 [178 Pages Report] The overall laser technology market is expected to grow from USD 12.9 billion in 2018 to USD 16.9 billion by 2024, at a CAGR of 4.65%. Huge demand from the healthcare vertical, enhanced performance over traditional material processing techniques, and shift toward production of nano and micro devices are the key factors driving the growth of this market. The market for system revenue accounts for the larger share of the laser technology market. The leading position, in terms of market size, of the system revenue segment can be attributed to the ability of the systems in performing a wide range of functions, which expands their utility across several verticals, such as industrial, commercial, automotive, and medical. System revenue covers the revenue generated from the sales of several types of laser systems, such as systems for marking & engraving, welding & brazing, cutting & scribing, drilling, cladding & coating, annealing, material removal, and other multi-function laser systems. The telecommunications end-user vertical accounts for the largest share of the laser technology market. The leading position of this vertical, in terms of market size, can be attributed to laser technology’s ability to enable faster and secure data transmission, while consuming low power. Laser communications not only provides high data transfer rates with low power consumption but is also a highly secure medium for data transmission. Apart from data transmission, in the telecommunications vertical, laser technology is also used for tasks such as signal strength optimization, precise network design, and proper tower placement. Continuous demand for cost-effective and fast processing laser machine tools from semiconductor, automotive, industrial, and telecommunications verticals are expected to drive the growth of the laser technology market in APAC. APAC has been ahead in terms of adoption of laser technology products and solutions compared to other regions. The region’s huge population, increasing R&D investments, and growing manufacturing and electronics sectors are expected to drive the growth of the market. A few major companies in the laser technology market are: Coherent (US), IPG Photonics (US), Trumpf (Germany), Lumentum (US), Jenoptik (US), Novanta (US), Lumibird (France), LaserStar (US), Epilog Laser (US), and MKS Instruments (US). Organic growth strategies, such as product launches, is a focus of many of the above. Prominent players have adopted product launches, followed by mergers & acquisitions, as the key business strategy to strengthen their positions in the laser technology market. For instance, in November 2017, Coherent (US) launched the Total Power Control, a laser having application in multiphoton excitation (MPE) microscopy. Based on acousto-optic (AO) technology, this laser enables high-power output and modulation on tunable femtosecond output. In October 2018, Trumpf (Germany) launched the TruLaser Cell 7040, a 3D laser system that can be used for cutting and welding application in 2D or 3D. In May 2018, Coherent (US) acquired O.R. Lasertechnologie, a German laser technology provider, enabling it to enhance its laser technology product portfolio. In December 2017, IPG Photonics (US) acquired Laser Depth Dynamics, a Canadian laser technology solutions provider, enhancing its laser product portfolio for welding applications. What are the upcoming trends in the laser technology market? What are the opportunities for the players present now, and those planning to enter at various stages of the value chain? How will the inorganic growth strategies implemented by key players impact the growth of the laser technology market, and who will have the undue advantage? What are the emerging industrial applications of laser? The study involved 4 major activities in estimating the size of the laser technology market. Exhaustive secondary research was done to collect information on the market, peer market, and parent market. The next step was to validate these findings, assumptions, and sizing with industry experts across value chain through primary research. Both top-down and bottom-up approaches were employed to estimate the complete market size. Thereafter, market breakdown and data triangulation were used to estimate the market size of segments and subsegments. 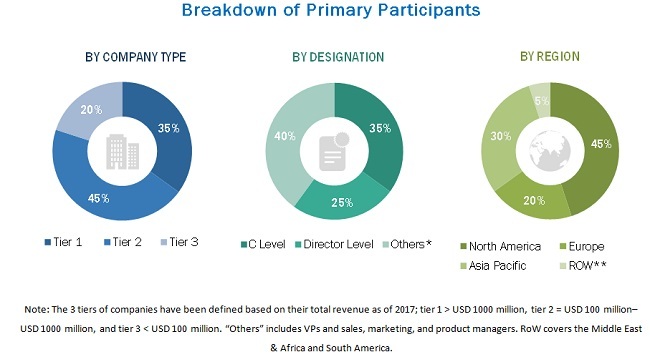 The research methodology used to estimate and forecast the laser technology market begins with capturing data on revenues of key vendors in the market, through secondary research. This study incorporates extensive use of secondary sources, directories, and databases (such as Hoovers, Bloomberg Businessweek, Factiva, and OneSource) to identify and collect information useful for a technical, market-oriented, and commercial study of the laser technology market. Vendor offerings have also been taken into consideration to determine market segmentations. The entire research methodology includes studying annual reports, press releases, and investor presentations of companies; white papers; and certified publications and articles from recognized authors, directories, and databases. The laser technology market comprises several stakeholders, such as suppliers of standard components and original equipment manufacturers (OEMs). The demand side of this market is characterized by the development of telecommunications, industrial, semiconductor & electronics, commercial, aerospace & defense, automotive, medical, research, and “other” end-user verticals. The supply side is characterized by advancements in types of lasers and diverse applications. Various primary sources from both the supply and demand sides of the market have been interviewed to obtain qualitative and quantitative information. Following is the breakdown of primary respondents. After arriving at the overall market size—using the estimation processes explained above—the market was split into several segments and subsegments. To complete the overall market engineering process and arrive at the exact statistics of each market segment and subsegment, data triangulation and market breakdown procedures have been employed, wherever applicable. The data have been triangulated by studying various factors and trends in both the demand and supply sides of the laser technology market. This report categorizes the laser technology market based on type, end user, application, revenue, and region. What new application areas are laser technology providers exploring? Which are the key market players and how intense is the competition?